Eco, from developer Strange Loop Games, is described on Kickstarter as a "global survival game," which implies that it's similar to open-world survival games like Rust and Ark: Survival Evolved that are all the rage these days. But in Eco, players are forced to work together to ensure not just their own survival, but that of the world around them, which is affected by just about every action they take. "The world of Eco will be home to a population of thousands of simulated plants and animals, each living out their lives on a server running 24 hours a day, growing, feeding and reproducing, with their existence highly dependent on other species," the Kickstarter pitch states. Things get complicated when humans—which is to say, players—get involved. 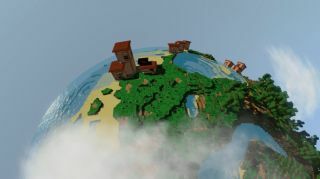 Resources must be gathered and used to survive and prosper, but unlike other games in the genre, every resource taken impacts the environment, "and without careful planning and understanding of the ecosystem, lands can become deforested and polluted, habitats destroyed, and species left extinct." It's apparently even possible to wipe out the entire food chain, resulting in "server-wide perma-death," which is why the game will also provide tools of governance that will enable players to propose, debate, and vote on laws that will affect everyone on the server. A player-run economy, technology and research, and even server-set options for world-ending scenarios like a meteor strike are also planned. The Kickstarter has been running for two weeks and is currently sitting at a little over $85,000 of a $100,000 goal. Stretch goals include a land ownership system with taxation and building rights, and increasing server capacity to support 100+ player counts. Those aren't necessarily the most exciting stretch goals ever conceived, but the overall simulation sounds potentially fascinating, even in single-player mode, which the game supports—although multiplayer is obviously where the action is. The Eco Kickstarter is on now and runs until September 10. More information about what the developers have planned can be found at strangeloopgames.com.